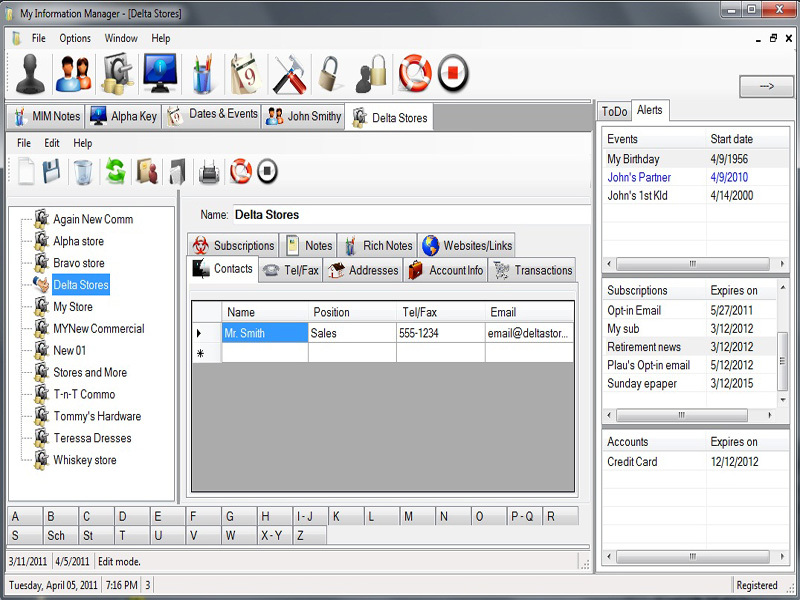 Developed for home users and small businesses needing a robust information processing and management system, from business transactions to Aunt Hildas birthday.Use My Information Manager as a personal data organizer or or business information manager. Excels at records management and archiving data. Password protection keeps your data safe and secure. Tabbed pages allow multiple windows to stay open for easy data retrieval. There are five main categories for long-term data warehousing: General Info, People, Commercial, Dates-Events and My Stuff. Create MIM Notes dynamically for short term data storage. General Info stores miscellaneous data and links to files on your hard drive or to a valid webpage. You set the categories and order your data to the selected category of your choice. People is the branch where you store information for friends, family and anyone else you need to know about, whether right away or sometime in the future. Your data on them will never go missing. Enter data for the persons partner, or spouse, and their children, to include birthdays which you can track in the Fast Alert viewer which starts when My Information Manager starts and alerts you to all upcoming events and occasions with a specific time span. Qweas is providing links to My Information Manager 1.21 as a courtesy, and makes no representations regarding My Information Manager or any other applications or any information related thereto. Any questions, complaints or claims regarding this application My Information Manager 1.21 must be directed to the appropriate software vendor. You may click the publisher link of My Information Manager on the top of this page to get more details about the vendor.